This is just the Lincoln remote control. To operate your tools you have to run another extra extension cord too! If you own a Hobart, Miller or Lincoln large engine driven welding machine you can't do without it! Have both auxiliary power and remote current control at your fingertips and use only a single 3 wire standard extension cord! You are free from running both an extension cord for power and another cord for your remote control! A single 3 wire extension cord does it all! Small 2 1/2 inch cube for a hand control unit. 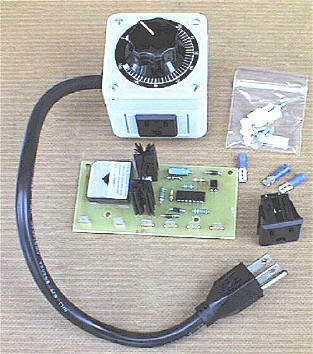 Uses a standard 3 wire extension cord for connection to the machine. 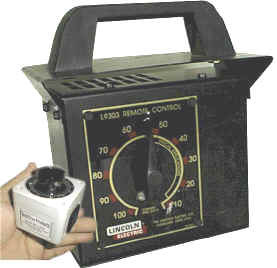 Has outlet for 120 volt AC or DC in hand control. Cool! Hand control does not generate any heat. Can be installed on over 58 different engine drives. No on/off or standard/remote switches to operate. Simply the hand control in and it's on. Unplug it and it's off. outlet without the hand control plugged in. Pipeliner can be used with GFI systems on welders with AC auxiliary power. Easy to understand installation and operational instructions. 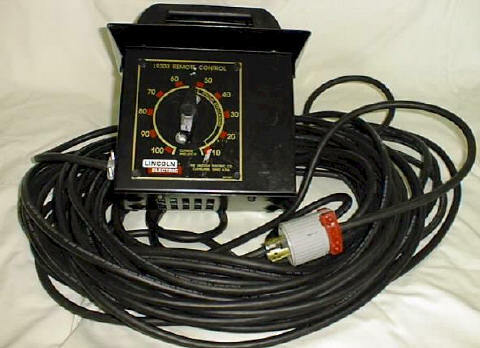 Isolated "snap-in" 120 volt receptacle. .187 terminals for the receptacle.